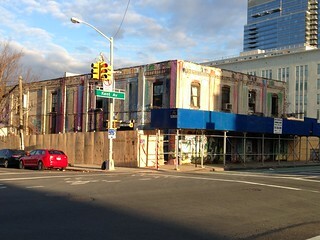 Brooklyn 11211 › Monster Island Going Down – What’s Next? Monster Island Going Down – What’s Next? Monster Island, prepped for demolition. The block-sized property on Kent Avenue between Metropolitan and North 1st is finally getting demolished. Sidewalk sheds and permits went up early this week, and demolition of one of the River Street buildings was in progress as of yesterday. What the future holds for this site is unclear. The property – once home to Monster Island, Duff’s, Mollusk and other Williamsburg 2.0 establishments – is still zoned for manufacturing use. That zoning designation was always tenuous at best, but since the rezoning of Domino seems to make little sense. Con Ed has already cleared its site across River Street (also with no plans for redevelopment), and despite the earlier rumors, it seems unlikely that Chetrit, who owns this site, will be putting a Whole Foods here. There are no permits on DOB for this site, so it’s anyone’s guess what is in store. Perhaps a rezoning (it would make a lot of sense to rezone all of the remaining manufacturing blocks along Kent between South 3rd and North 3rd), perhaps a new hotel (which seems to be the new highest and best use for M-zoned lots in Williamsburg 3.0).